Original found in the Schweizerishches Landesmuseum, Zurich. Classified as type XIIIa by Oakeshott, the Two handed Templar stands as one of the most significant swords of the medieval period. Favoured for its reach and devastating cutting abilities, the two handed sword gained ground as the most venerated weapon of the 12th and 13th c.
It’s wide blade and reach provided the knights with unmatched ability to break and penetrate the ever developing armors of the 13th century. As single-handed swords became inadequate against the leather and mail armor of the 13th C. heavier blades with wider blades were needed to break the mail and cut through leather armor. Hence the one handed swords of previous centuries were gradually replaced by larger cutting swords of the 12-13th C.
Numerous variations are found throughout the European continent, establishing a general conformity and indicating a clear pattern of influence among smiths of the time. Variations are found in the Royal Armoury of Turin, the Imperial Treasury of Vienna, the Royal Armoury of Madrid and in the Hermitage, Petrograd. 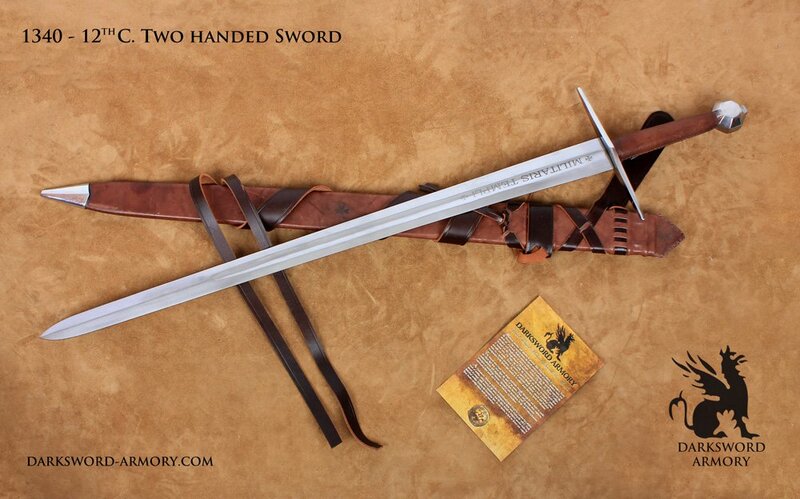 These two handed battle ready swords (12th century medieval sword) delivered powerful shearing cuts, and while large in size, they were still dynamic and responsive in their handling qualities. The sword of the Templar was not considered a mere weapon, but a religious relic. The crucifix Guard served not only for praying prior to battle, but also as a counter block in combat. The Guard, individually crafted from mild steel and finely shaped with smooth lines, is further accentuated by the rich leather wrapped Oak handle. 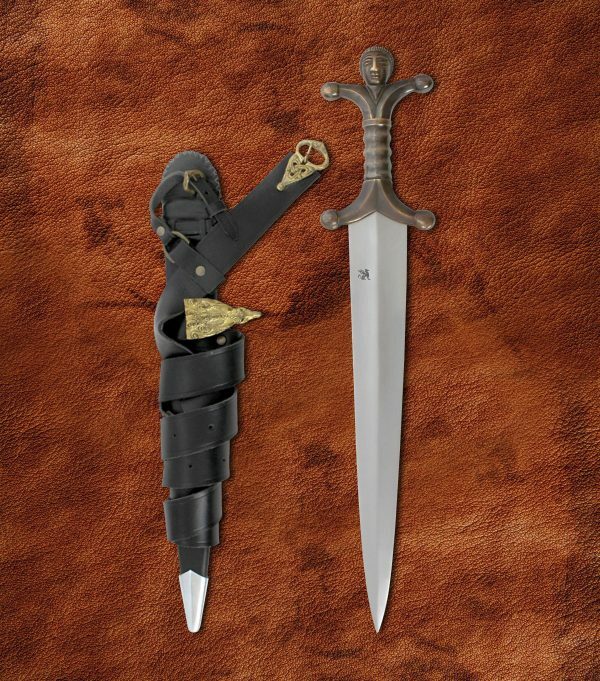 The two handed Templar Sword is not only one of our best sellers, it is one of the top “Staff picks”. Hand crafted and properly engineered for durability in combat, the Two Handed Templar Sword is a very solid, responsive, and surprisingly well balanced for a sword of this statute. The blade, hand forged with 5160 High Carbon Steel, is skillfully Dual Hardened for precise cutting while remaining flexible for enduring combat. 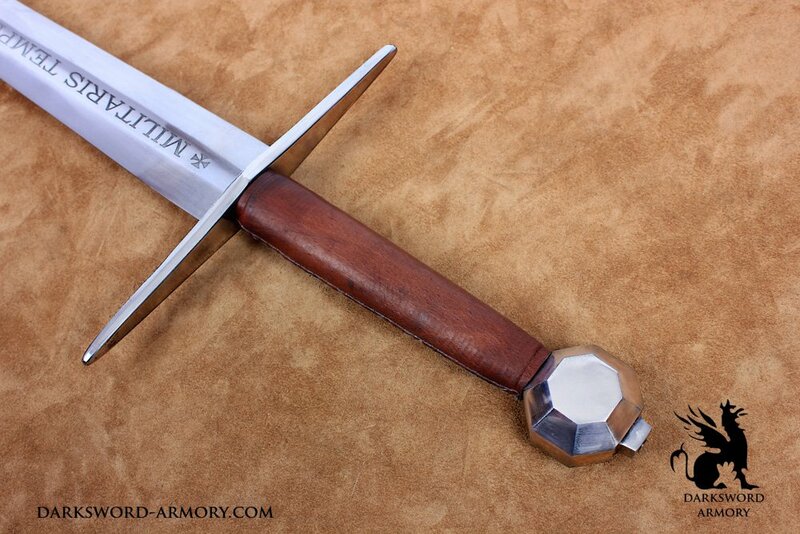 In a nutshell, the Two handed Templar Sword is a finely crafted sword that is built to last ! “I received my sword last evening and it has exceeded my already high expectations. It is pristine and wonderful. I will acquire all my future blades from Darksword. Feel free to use me as a reference. Very respectfully, William Edward Graf v. Ettendorf-ReBrook”. ~William Edward Graf v. Ettendorf-ReBrook , U.S.A. I purchased this sword to replace an older version of it that was lost in a wildfire. The new model is wonderful, beautifully crafted, very responsive, feels lighter than advertised, blade geometry is bang on, and the sharpening service was well worth the extra fee. The brown leather grip and scabbard are an attractive high quality leather. I’m very excited to see what comes next, keep up the great work DSA! Thank you! This is absolutely my favourite sword from my collection. The quality is exceptional, while being a highly practical blade – one that feels and moves like it is indestructible and could cut through anything. Meanwhile the grip is very comfortable and made of good leather. The guard is sturdy and could indeed be a potential weapon. I really like the pommel, which is seen in several of the larger swords of the period (late 12th-early 13th century), and counterbalances the delightfully heavy blade. This iconic sword represents what the magnates of the High Middle Ages would have mastered in order to prepare themselves for the battlefields of Europe and the Holy Land. I’ve had this sword less than a week and it already feels like a part of me. Huge thanks to everybody at DSA for creating and making affordable such incredible blades. This is my first sword and I love it! Elegant, beautiful, sturdy and easy to handle. I highly recommend it. Thanks DSA! 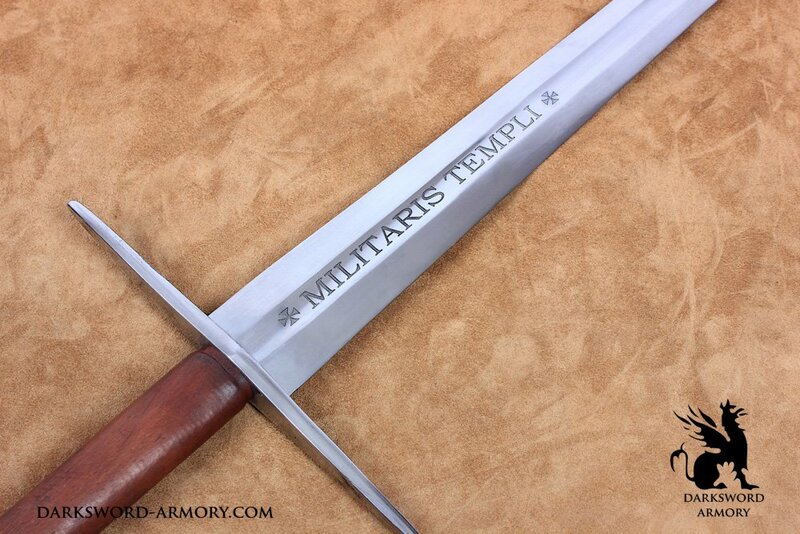 I received my 12th century Templar sword and was astounded at the craftmanship and quality. Living in Germany where the Great Sword got it’s start, and where one can see authentic examples in museums, it was important for me to have one that looked and felt like the originals. Dark Sword more than exceeded my expectations: Holding this sword is like travelling back in time. 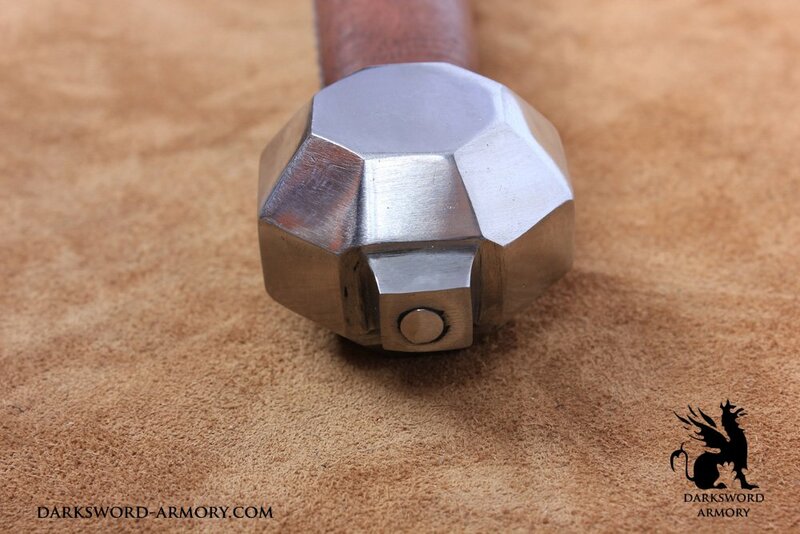 The hexagonal pommel, leather-wrapped handle, simple cross guard, and barely visible forging marks on the fuller and blade is like holding a piece of history. It’s not hard to imagine a mounted crusader swinging this sword from his horse while charging through battle. I can’t wait for my next purchases!